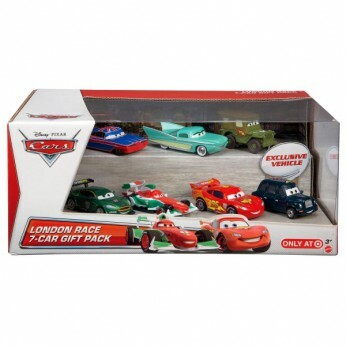 This die-cast seven-pack includes Disney/Pixar Cars vehicles in special diorama packaging. With huge character variety and authentic styling, these 1:55 scale die-cast figures are perfect for recreating favourite racing scenes from the Cars films. Styles may vary. This toy costs approximately £24.99 (for the latest and best prices make sure you check our retailer list for the Cars Diecast 7 Car Gift Pack above). In our review of Cars Diecast 7 Car Gift Pack we classed it as being suitable for ages 3 years, 4 years, 5 years but recommend you check the manufacturer specific advice before purchasing.